Ten diagrams from W. B. Yeats’ A Vision (“B” edition, 1937). A Vision details an esoteric geometry and its applications, ambiguously channeled via automatic script and speech by Yeats’ wife, George, then organized and augmented by Yeats himself. 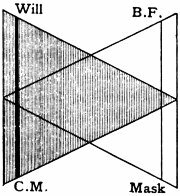 “If I call the unshaded cone ‘Discord’ and the other ‘Concord’ and think of each as the bound of a gyre, I see that the gyre of ‘Concord’ diminishes as that of ‘Discord’ increases, and can imagine after that the gyre of ‘Concord’ increasing while that of ‘Discord’ diminishes, and so on, one gyre within the other always” (p68). Here the three-dimensional gyres, or spirals, are represented more easily by cones or triangles. The primary tincture, shaded, represents objectivity, Concord, space, the solar, the reasonable, plasticity, passivity; the antithetical tincture, unshaded, represents subjectivity, Discord, time, the lunar, the natural, beauty, unity of being. “Whereas subjectivity tends to separate man from man, objectivity brings us back to the mass where we began” (p72). 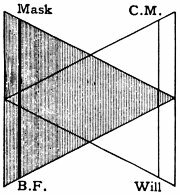 “Within these cones move what are called the Four Faculties: Will and Mask, Creative Mind and Body of Fate. 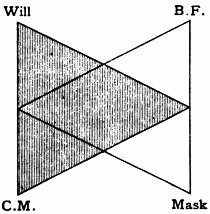 Will and Mask are the will and its object, or the Is and the Ought; Creative Mind and Body of Fate are thought and its object, or the Knower and the Known. The first two are lunar or antithetical or natural [subjectivity], the second two solar or primary or natural [objectivity]” (p73). “These pairs of opposites whirl in contrary directions, Will and Mask from right to left, Creative Mind and Body of Fate like the hands of a clock, from left to right… As Will approaches the utmost expansion of its antithetical cone its drags Creative Mind with it — thought is more and more dominated by will. Then, as though satiated by the extreme expansion of its cone, Will lets Creative Mind dominate, and is dragged by it until Creative Mind weakens once more… The Mask and Body of Fate occupy those positions which are most opposite in character to the positions of Will and Creative Mind. If Will and Create Mind are approaching complete antithetical expansion, Mask and Body of Fate are approaching complete primary expansion, and so on. In the following figure the man is almost completely antithetical in nature” (p74-7). The vertical lines mark the positions of the Faculties in their respective cones. To represent direction, Yeats indicates expanding Faculties along the bottom of the diagram, and contracting Faculties along the top. “In the following [man is] almost completely primary” (p77). “In the following he is midway between primary and antithetical and moving towards antithetical expansion” (p78). 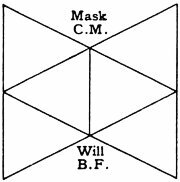 “A particular man is classified according to the place of Will, or choice, in the diagram” (p73). 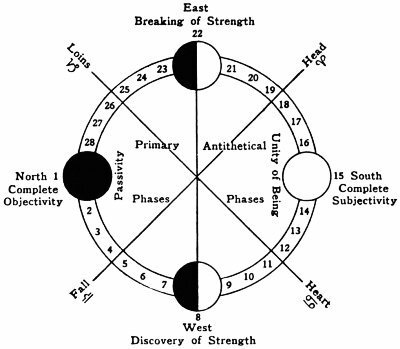 “I have now only to set a row of numbers upon the sides to possess a classification… of every possible movement of thought and of life, and I have been told to make these numbers correspond to the phases of the moon [see last diagram of previous post]. The moonless night is called Phase 1, and full moon in phase 15. 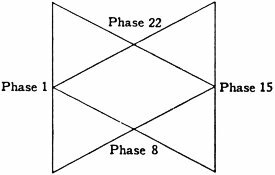 Phase 8 begins the antithetical phases, those where the bright part of the moon is greater than the dark, and Phase 22 begins the primary phases, where the dark part is greater than the bright” (p78-9). For each phase, Yeats derives the character and destiny of a man whose Will is so located, and whose Mask, Creative Mind, and Body of Fate have assumed their complimentary locations and influences. This discussion constitutes the largest topic of A Vision. Here are a few excerpts that reveal such interplay. Phase 10, The Image-Breaker: “If he live like the opposite phase, conceived as a primary condition — the phase where ambition dies — he lacks all emotional power (False Mask: ‘Inertia’), and gives himself up to rudderless change, reform without a vision of form. He accepts what form (Mask and Image) those about him admire and, on discovering that it is alien, casts it away with brutal violence, to choose some other form as alien. He disturbs his own life, and he disturbs all those who come near him more than does Phase 9, for Phase 9 has no interest in others expect in relation to itself. If, on the other hand, he be true to phase, and use his intellect to liberate from mere race (Body of Fate at Phase 6 where race is codified), and so create some code of personal conduct, which implies always ‘divine right’, he becomes proud, masterful and practical. He cannot wholly escape the influence of his Body of Fate, but he will be subject to its most personal form; instead of gregarious sympathies, to some woman’s tragic love almost certainly…” (p122). Phase 17, The Daimonic Man: “He is called the Daimonic man because Unity of Being, and consequent expression of Daimonic thought, is now more easy than at any other phase. 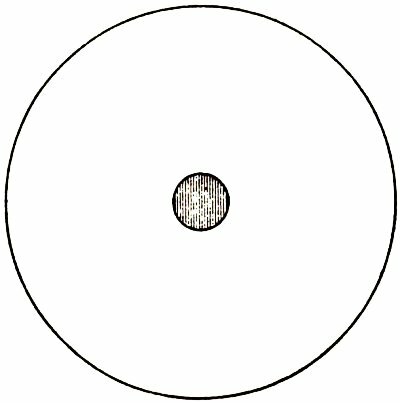 As contrasted with Phase 13 and Phase 14, where mental images were separated from one another that they might be subject to knowledge, all now flow, change, flutter, cry out, or mix into something else; but without, as at Phase 16, breaking and bruising one another, for Phase 17, the central phase of its triad, is without frenzy. The Will is falling asunder, but without explosion and noise. The separated fragments seek images rather than ideas, and these the intellect, seated in Phase 13, must synthesize in vain, drawing with its compass-point a line that shall but represent the outline of a bursting pod. The being has for its supreme aim, as it had at Phase 16 (and as all subsequent antithetical phases shall have), to hide from itself and others this separation and disorder, and it conceals them under the emotional Image of Phase 3; as Phase 16 concealed its greater violence under that of Phase 2. When true to phase the intellect must turn all its synthetic power to this task. It finds, not the impassioned myth that Phase 16 found, but a Mask of simplicity that is also intensity…” (p141). Phase 25, The Conditional Man: “Born as it seems to the arrogance of belief, as Phase 24 was born to moral arrogance, the man of the phase must reverse himself, must change from Phase 11 to Phase 25; use the Body of Fate to purify the intellect from the Mask, till this intellect accepts some social order, some condition of life, some organised belief: the convictions of Christendom, perhaps. He must eliminate all that is personal from belief; eliminate the necessity for intellect by the contagion of some common agreement… There may be great eloquence, a mastery of all concrete imagery that is not personal expression, because though as yet there is no sinking into the world but much distinctness, clear identity, there is an overflowing social conscience. No man of any other phase can produce the same instant effect upon great crowds; for codes have passed, the universal conscience takes their place. He should not appeal to a personal interest, should make little use of argument which requires a long train of reasons, or many technical terms, for his power rests in certain simplifying convictions which have grown with his character; he needs intellect for their expression, not for proof, and taken away from these convictions is without emotion and momentum. He has but one overwhelming passion, to make all men good, and this good is something at once concrete and impersonal; and though he has hitherto given it the name of some church, or state, he is ready at any moment to give it a new name, for, unlike Phase 24, he has no pride to nourish upon the past. Moved by all that is impersonal, he becomes powerful as, in a community tired of elaborate meals, that man might become powerful who had the strongest appetite for bread and water…” (p173-4). Finally, Yeats, speaking of his own time and place in history (for the Great Wheel can describe history as well as individual man — another topic in A Vision): “When the new gyre begins to stir, I am filled with excitement. I think of recent mathematical research… with its objective world intelligible to intellect; I can recognize that the limit itself has become a new dimension, that this ever-hidden thing that makes us fold our hands has begun to press down upon multitudes. Having bruised their hands upon that limit, men, for the first time since the seventeenth century, see the world as an object of contemplation, not as something to be remade, and some few, meeting the limit in their special study, even doubt if there is any common experience, doubt the possibility of science” (p300). For more information, consult Neil Mann’s excellent analysis of the complete work. Also, be sure to check out Hazard Adams: “The Book of Yeats’s Vision,” which sets aside the problem of ‘belief’ and the whole messy system, and looks at the whole work as a book of antithetical consciousness, instead of a book of primary knowledge. I aam regular reader, hoow arre yyou ?verybody? Thiss post posteed aat thijs site iis genuinwly pleasant.